TThe HD-9XL four-post lift features wide drive-thru clearance and a standard lift-height but with extended runways for accommodating longer wheelbase vehicles. About the size of a typical parking space, these lifts truly maximize valuable floor space. Use them for storing cars and trucks, ATVs, snowmobiles, jet skis, golf carts, boats or just about anything else that needs to be up off the ground and safely in the air. If you've got at least a standard 8-foot ceiling, you'll be able to make use of that wasted vertical space above your car. 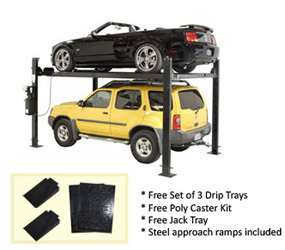 And optional caster kit allows you to roll the lift outside or wherever best suits your need. The HD-9XL is equipped with multiple adjustable height locking positions for variable-height parking. A convenient push-button pneumatic safety lock control releases all four independent safety locks simultaneously. Each lift is supplied with 4 high-quality stainless steel lifting cables, rated at 14,400 lbs. each. The combined rating of these cables is 640% of the maximum lifting capacity of the entire lift! And we make sure it looks tidy too?all lifting cables are fully enclosed within the lift structure itself. 10" x 12" base plates provide a solid foundation for the HD-9XL. All HD-Series lifts feature a durable powder-coat finish that gives the metal a high-quality, extremely durable finish which can withstand even the harshest environmental or chemical conditions. Unlike other companies that claim to powder coat, we take pride in our meticulous 10-step process. First, all parts are visually inspected before being sandblasted. Afterwards, the parts are washed in our 5-stage phosphate tanks that can accommodate parts up to 25' long. Once cleaned, they're immediately dried to avoid rust production, and then outgassed. Outgassing pre-bakes the parts in a curing oven, reducing the possibility of blemishes that may be hiding in the pores of the metal. If not properly outgassed, imperfections in the metal may bubble during the curing process and most likely will cause chips in the powder. After the parts are washed and outgassed, any surfaces and / or threaded holes that need to be masked or plugged, are done so with high-temperature masking tape and silicone plugs. Next, the parts are given a quick thinner wipe to remove any light debris or fingerprints, before being hung on an electrostatically grounded conveyor line. The powder is finally applied using an electrostatic spray gun. The powder "sticks" to the surface in a fashion similar to how dust sticks to a television screen. Once the parts are powder coated, the carts are rolled into our curing oven and baked at 400? F for 45 minutes. Take your pick. You're currently looking at the extra-wide, standard-height HD-9XL. The HD-9ST is the narrow model, the HD-9 is the standard-width model and the HD-9STX is the narrow-width, tall model car lift. 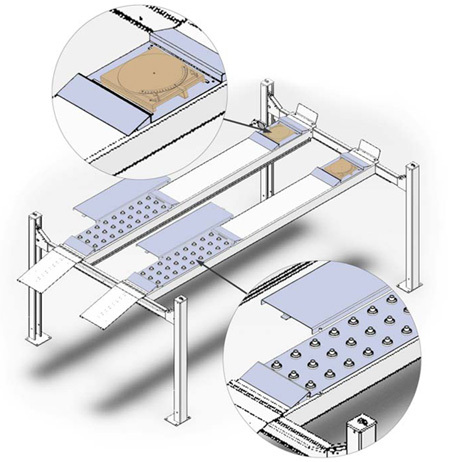 Polypropylene drip trays from BendPak are a perfect, cost-effective solution to a messy problem. 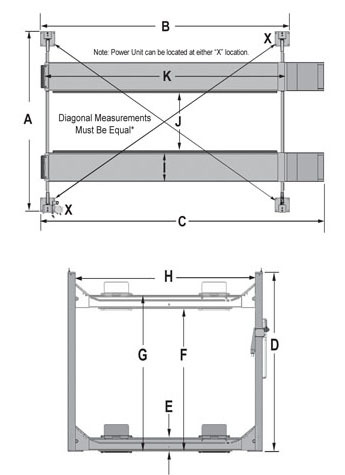 A reversible design allows them to accommodate BendPak four-post lifts with the runways positioned either wide or narrow. These drip trays are an essential four-post lift accessory, especially if you have a vehicle that leaks. 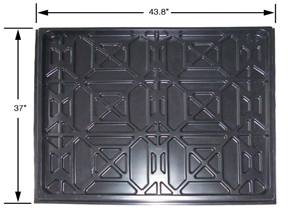 These affordable, impact-resistant polypropylene drip trays are rugged and light, and help solve the common problem of potentially harmful drips. Each tray comes with 56 articulated catches and gutters to restrain the fluid from sloshing out. So all that oil, coolant and other muck stays neatly contained within individual compartments, even when carried or bumped. A smart, black color hides the appearance of stains and blemishes. (* )This dimension may be limited with the addition of rolling jacks. See rolling jack specifications on separate page.The design, material and specifications are subject to change without notice.